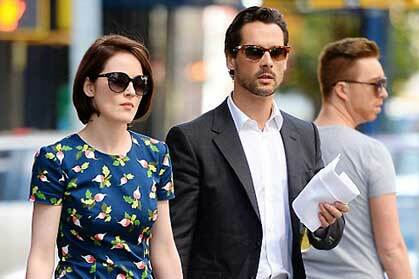 Michelle Dockery and her Irish boyfriend John Dineen in New York earlier this month. "Downton Abbey" breakout star Michelle Dockery has a new Irish boyfriend who she’s apparently smitten with. She’s been seeing John Dineen, a 31-year-old Cork-born financial consultant based in London who she met through her Irish-born Downton castmate Allen Leach. Dockery, also 31, lives near her new beau in London, and she brought him along to New York where she made the scene last week at Fashion Week and the U.S. Open. “John is also from Ireland and went to university in both Cork and Dublin before coming to London. He is very private and softly spoken but he has really been taken by Michelle. Allen is an old friend and appears to have played Cupid,” a friend of Dineen’s told the Daily Mail. Dockery plays Lady Mary in the wildly popular Downton. She’s no stranger to Irish men in her life, as her father is a native of Athlone, Co. Westmeath. Prior to starting her relationship with Dineen, Dockery was dating an American architect for three years.